Note: We no longer eat pork but I’ve found this recipe works just as wonderfully with boneless, skinless chicken breasts! Chicken version coming soon. 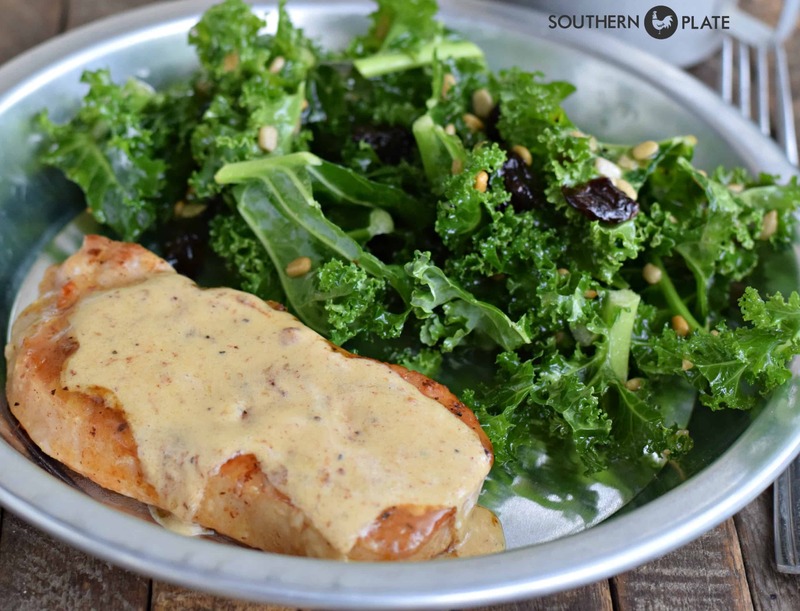 Velvet Pork Chops are seared in butter, infused with rich chicken broth, and topped with a browned butter cream sauce, they’ll never believe how simple this recipe actually is! My husband doesn’t like gravy. Many of you who have been with me a while may remember me mentioning that from time to time. Although, after seventeen years of marriage, I’ve learned that he really isn’t as opposed to it as he thinks he is. At some point in his life, “gravy” was tasted and terribly disliked and so the term itself always brings a slight flinch to his face. As a result, I have learned to use the word “sauce” in it’s place. A simple vocabulary switch and everyone is happy. These pork chops make him doubly happy, though. He asks for these things about as often as Katy asks for Chicken and Dumplings, and we have been known to have them twice in one week when Ricky manages to get a particularly pleading look in his eyes. Fortunately, the recipe is simple as can be, which is surprising once you taste the amazing flavor, they are unlike any other pork chop you have had! To make the beauties you’ll need: Heavy Cream, Chicken Broth*, Butter, Pork Chops, Salt, and Pepper. These pork chops are kinda standard, boneless chops. Not thick cut and not thin. Thick would work fine, though, especially since we actually end up cooking them a little longer than necessary while they are enjoying their rich, chicken broth bath. *I am using a chicken broth concentrate which I will mix with water before using. I LOVE this stuff. I found it at Wal Mart but surely to goodness other places have it, too. I use it all the time now. You can use regular chicken broth if you like, no prob. 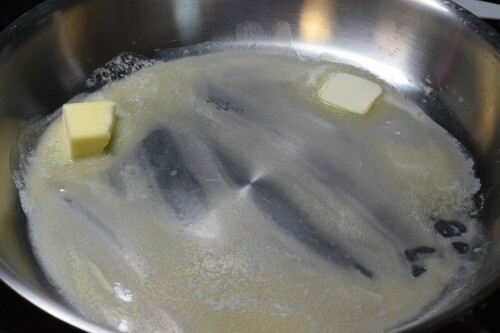 Melt a little butter in a large skillet over medium heat. As always, exact measurements are in the recipe card at the bottom of this post. Add your chops and salt and pepper them to your taste on the top. Cook these in the butter until lightly browned, then flip and repeat. 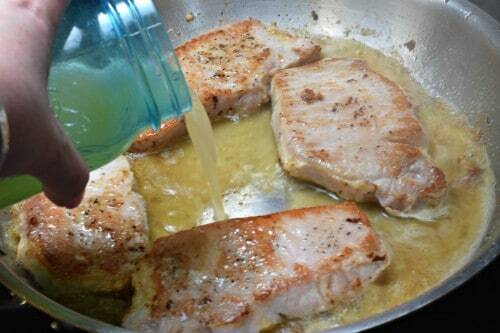 Once the pork chops are just browned (not cooked all the way through), pour in your chicken broth. Continue cooking until the chicken broth is all cooked down. This will take anywhere from 5-10 minutes, likely more like ten. I just kinda stand there and talk to the kids during this step so it is hard for me to keep track of time. Remove your chops to a plate. Look at that beautiful glaze on them! When you take them out, your pan will look a bit like this. Now that is browned butter and concentrated chicken broth remaining along with browned bits of pork chop. Lots of flavor going on here! Turn the heat off. That skillet is hot enough for what we want to do already. Add your cream. 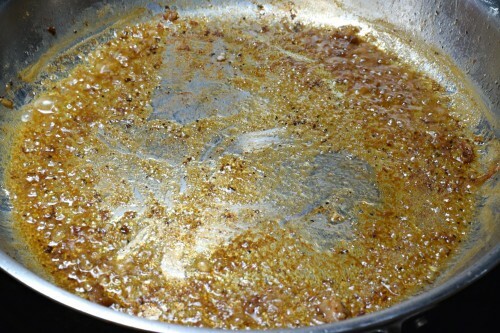 Using a wooden spoon type thing or something with a flat bottom if you have it, scrape and stir all around that pan until all of that yummy flavor from the bottom is part of your sauce and it looks like this. This will only take a few minutes and as you do so the cream will get heated up plenty. Serve pork chops topped with the cream sauce and enjoy! This is one of those deeply satisfying pork chops for a number of reasons: The layers of flavor, richness of the sauce, and tender pork beneath it all. Serve it with a side of your choice. Mine is pictured with a generous helping of my Super Food Salad. Melt butter in large skillet over medium high heat. Add pork chops and salt and pepper tops of them. Cook until browned, then flip and salt and pepper again. Continue cooking until opposite side is brown. Pour in chicken broth, reduce heat to medium, and cook until broth is mostly evaporated, about ten minutes. Once broth has cooked down, remove chops from pan and turn off heat but leave pan on the stove eye. Have a wooden spoon handy and pour the cream into pan. 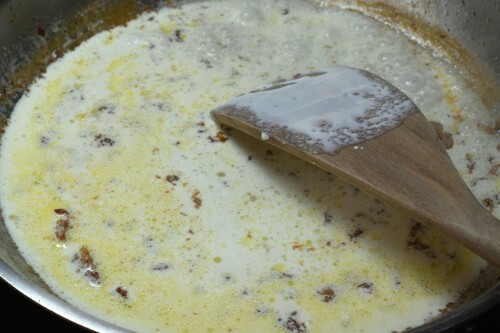 Immediately start stirring and continue until the pan remnants are fully blended in with the cream and cream is warm and thick, just a few minutes. Serve chops with delicious cream sauce spooned over them. Homemade Lemon Scented Play Dough! Oven Fried Green Tomato Caprese Stacks and a Cookbook Review! Let me know how you like it! Have a great afternoon! oooooohhhh you made this low carber a very happy girl last night! This was great! I added a couple of shakes of Parmesan cheese to the gravy at the end to add a kick. Boy was it ever good. Thank you Christy! Oh my goodness, I bet that was good!! I am so glad you tried it and liked it!! 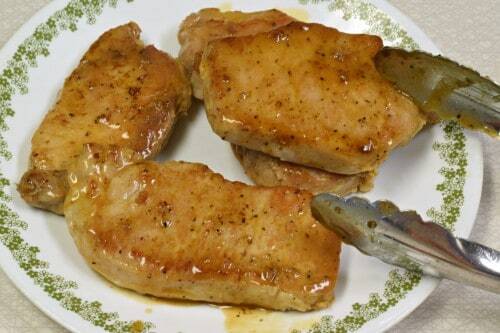 I have made these pork chops for years, always called them Southern Smothered pork chops! My family loves them too! We had this for dinner tonight and we loved it! My sauce wasn’t as thick as yours looked, but I feel that was my fault ( didn’t reduce the broth quite enough). We will be having this again! Thanks for a great recipe! I am so glad you liked it Janet!! I had this same thing happen both times I tried it. Think I’ll reduce the chicken broth to 1/2 and try that. It is so yummy! I prepared your “Velvet Pork Chops” for supper this evening. Oh! My! Goodness!!! They were amazing. Delicious! My husband ~ who generally hates pork chops~ loved them! Thank you for a super delicious keeper recipe. I am so glad to hear you liked them Mary!!! How many calories in velvet pork chops? Making my shopping list as we speak! Can’t wait to try out the Kitchen Accomplice chicken broth. I am not a fan of boneless pork chops. I was raised on a farm and everything was bone in. To me the meat is juicer with the bone in. Can this recipe been done just as well with the center cut bone in pork chops? I don’t see why not. Hope you get to try it soon! Pork loin roast goes on sale regularly around here for around $1.50/lb, sometimes less. I was always frustrated by the fact I could never get it fork tender (that’s what tenderloins are for, I guess). Next roast I bought I sliced up into 3/4″ chops and fried up Southern style (egg, milk and flour coating). They were tasty and very tender. Yes, it would!!!! I LOVE YOUR GRANDSON’S THINKING! lol. Sounds like he’s being raised by some good people! Christy, i fixed these for supper after church last night, Aldi had pork chops on sale, woot-woot! My daugher said these were the best things she ever ate, and my son in law went back for 3rds (I doubled the recipe.) My granddaughter (3) doesn’t care for meat but she ate these, and Brother (18 months) was tearing them up, making that little “happy baby humming” noise. I fixed mashed taters and some sauteed squash with them. A good time was had by all, and the kids did the dishes! I am so glad they were a hit!!! And oh my goodness, when the kids do the dishes, that makes for a perfect meal!!! Thank you so much! I hope he enjoys it as much as my husband does. #3 debuts October 4th, maybe I’ll get to meet ya this tour!! Ooh, Christy, I’m so excited to see there’s a date for the new book! I’ll be getting one for me and one for my mother. 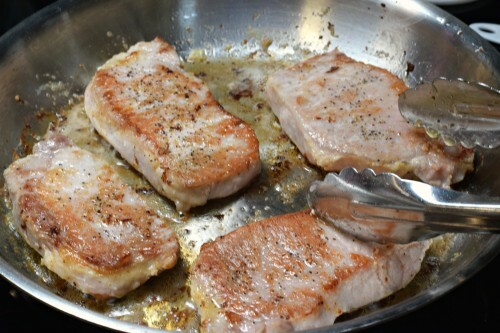 These pork chops looks great. I’m always trying new ways to make pork chops. I’ll definitely try this in the next week or so and I’ll post again when I do. Thanks, as always, and have a great week! 🙂 Thank you Samantha!!! I hope you had a great weekend as well!! I found that concentrated broth at WalMart too. I love the stuff, takes up less space in the pantry and the fridge. And you can make your broth as rich tasting as you please. This looks wonderful! 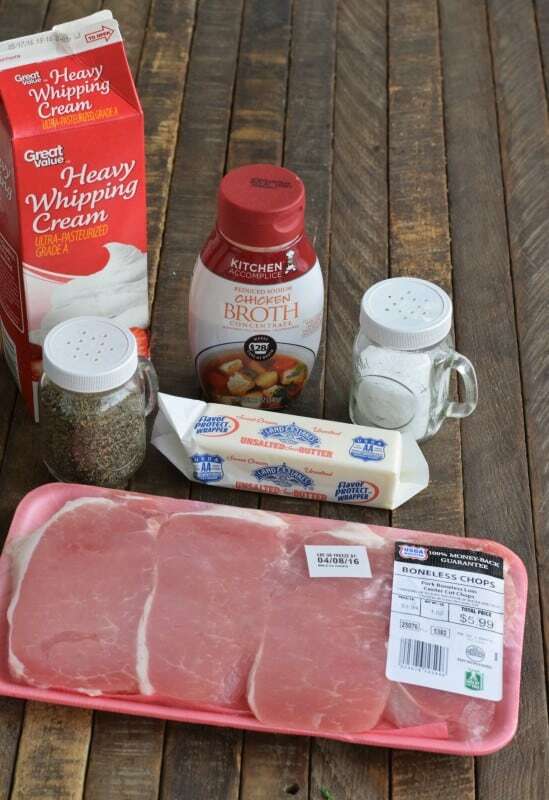 I am always looking for new pork chop recipes and I can tell this one is going to be a favorite. Thanks for sharing and hope your day is full of blessings. The whatchamacallit thing is a spertle (Sp?). That is what the Galloping Gourmet used to call it! hey girl This looks amazing! I don’t like gravy either! and I’m from the south (Arkansas) My family thinks I’m crazy! I don’t like gravy either, but next time I cook chops, I am making them by this recipe!!!! I hope you get the chance to try them soon Tami!!! You say you add water to the concentrated broth. How much concentrate and how much water? Also, I think this “sauce” would be great over mashed potatoes too. What do you think? It would be WONDERFUL over mashed potatoes! When I use concentrate I just add enough water to make it regular broth strength, per package directions. Does this make enough sauce to serve with noodles? Can’t wait to try it tonight and was planning a side dish. That browned butter cream sauce looks so good! I can’t believe that you’re hubby doesn’t like gravy! hahaha. Glad that you switched it up to “sauce” so that he could enjoy these chops! 🙂 It’s all about perspective! Tried this recipe using boneless chicken breast – it was absolutely wonderful! It did take more like 15-20 minutes for the broth/butter mixture to reduce; maybe the chicken breast gives off more juices while cooking than pork chops? In any case, this recipe is a winner and will definitely go into the dinner rotation. Thanks also, Christy, for the tip on the concentrated chicken broth. Found it at my local Walmart today and I am a fan already. I’ll probably pick up the beef flavor next time I am there. The flavor is really rich and it is very economical. Thanks as always for your recipes, stories, and for being the inspiring light that you are! I am so glad you liked it Sharon!! I bet the difference is the moisture content in the meat. I will have to try it with chicken and see how it turns out for me. Christy, if we don’t get the sauce reduced enough couldn’t we thicken it with the Glu—- (can’t remember the rest of it but I ordered it on Amazon)? Arrowroot works the same. Christy: This is a keeper. My picky brother even thought it looked good. I don’t know if he’s tried it yet though. I didn’t get my gra. . .oops!-we are calling it sauce for Ricky’s sake-reduced down quite enough, but it was still good, and I had a homemade hamburger bun to use as a sop for it, along with the mashed cauliflower-can’t have potatoes. I have 2 chops left over, do you think they’d freeze? This is pretty calorically dense, not to mention the cholesterol, and I don’t know if I want to eat it 3 days in a row. Not that I couldn’t. I haven’t seen the concentrated broth you mentioned, so I just use reduced sodium chicken base and make the broth however I want it. We just had this for lunch and it tasted great! Also tried the broth concentrate for the first time and it’s very good! Can’t wait for book #3! Yes, I think it will work great with chicken as well. Let me know when you get a chance to try it!! Christy, I had family over for Sunday dinner and I fixed your recipe of velvet pork chops. I used 6 pork chops so used 2 more tblps of butter extra chicken broth and extra cream. They turned out great they were a nice color of brown gravy is delicious. Thank you for that recipe . Will make this again. Really enjoy your recipes. I am so glad you enjoyed them Virginia!!! I must say, my ability to make gravy has helped us through some lean times! Gravy often made the difference in how poor we felt at the dinner table. Plain old chicken and potatoes can become a creamy casserole or a sumptuous feast of flavorful vittles. At times when my meal plan has relied heavily on potatoes, rice, bread, etc. 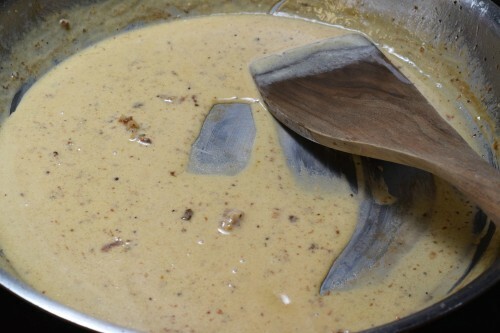 I’d whip up a gravy to give a meal a little richness and feel like… more. We were dirt poor for about 7 years though and now my husband, like yours, shudders at the mention of gravy. I guess he’s burned out. 🙂 Thank goodness for gravy! 🙂 I think gravy has helped many folks through those lean times when there just wasn’t much else. I too am grateful for gravy!! I have now fixed these twice and my family really likes them! I love that they are made with cream and no flour! Thank you so much for this recipe! I am 100% sure I will make many times again in the future. I am so glad to hear that you liked them, coming from you this is high praise indeed, UmMa!!! 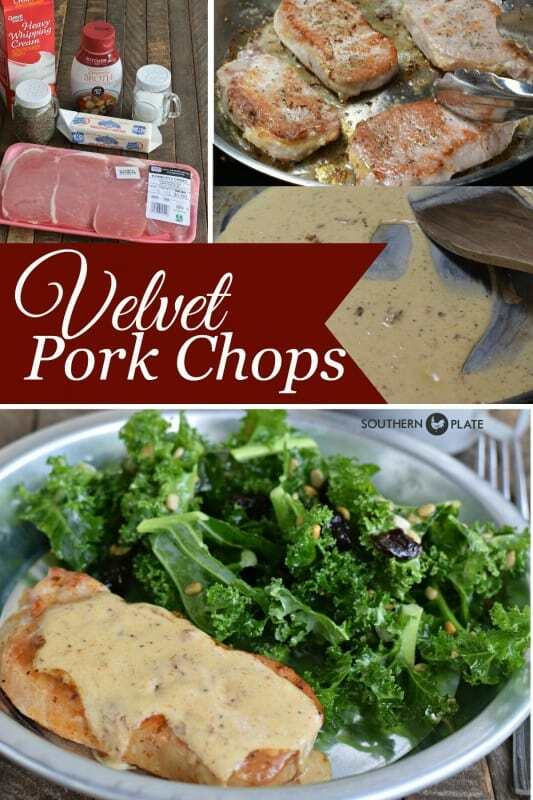 I made these pork chops last evening for supper and they are “velvety delicious”! My husband went on and on about them and said the chops were so tender and moist. Thanks again for a fabulous recipe! I am so glad y’all liked them Tamra!!! Christy, I made these last night and they came out very tough. Are you really supposed to cook them st such a high temp? It took my broth about 25 minutes to cook down. The sauce was nice but the chops were very tough. Hey! My chops are always really tender when I cook it this way. It takes the high temp to cook the broth down and that is what keeps the chops moist. Sometimes, though, I buy pork chops that are just better than others (from start to finish) so that may be what happened here. We may be using entirely different temperatures as well, as ovens vary. Either way, I’m sorry it didn’t turn out as you’d hoped! I have fixed these chops numerous times since you first shared them and they are wonderful! We put the sauce over mashed potatoes. 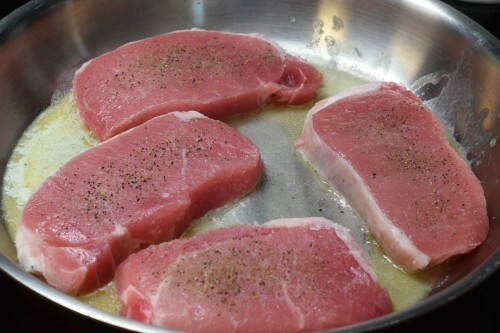 I have been using thicker boneless chops because that is what I had on hand; however, I think they would be better with the thinner ones as they would cook quicker. By the time the thicker chops get done they are beginning to be on the dry side. We always make extra sauce too. Christy, I finally made these pork chops last night and they were delicious! I used bone-in pork chops, and half and half instead of cream. They came out tender and juicy and the “sauce” was great. I’ll definitely be making these again. Thanks for another terrific recipe! I am so glad you got the chance to try them out and liked them!!!! Very delicious! this recipe is in the keeper file. I am so glad you liked them Charles!!! Christy: I just tried it with chicken, and it’s even better-much as I like a good pork chop. I didn’t use the breast. I can get Chicken Leg Steaks at my local market. They are deboned and skinned leg quarters. I like dark meat better than the breast, so I went with those. It’s a total keeper no matter which meat you choose. I’m wondering if you could do round steak, or cube steak in it with beef broth instead of chicken broth? I may have to investigate that! This sounds awesome! Will definitely be try in g these! Thank you very much! I hope you get the chance to try them soon Loretta!! Made this for dinner last night….OMG, this was so delicious for something that was sooo easy to make! Thank you Christy for this recipe. This week our dinner menu has 3 of your recipes on it. This was the first one for the week, and I made the Oreo Ice Cream Cake for dessert. So far both are a huge hit, so looking forward to the rest of the week! Thanks again. 🙂 I am so glad you tried the pork chops Patty!!! They are one of our favorites, and yes, a BIG plus is how easy they are!! I hope you enjoy the other recipes, I can’t wait to hear what all you plan to try! Made these last night. Thanks for another wonderful recipe as always. I am so glad you like them Jen!! !